Autumn is just around the corner, and its time to think about creating beautiful fall containers! Fall containers and flowering baskets are a great way to add color when summer’s blooms begin to fade. As the autumn air turns crisp, there are a wide variety of great-looking plants that actually thrive in the cooler conditions. Many of which happen to be perfect for planting in containers and baskets! Although mums are the perennial go-to when it comes to selecting plants that bloom in the fall, they are not the only choice. In fact, there are a whole slew of additional varieties to select from that will give your patio, porch, or outdoor living area a unique autumn feel. Not only can they bring fall color – they can serve as a great conversation piece for visitors! Here are 4 great choices that can brighten up fall planters, hanging baskets, containers and more. Although purple fountain grass is grown as a perennial in warmer climates, it is perfect as a potted annual everywhere. And it makes a wonderful choice to use as a centerpiece for fall planters! The vertical growth, bright purple grass, and showy plumes that bloom in the fall form the perfect centerpiece. Purple fountain grass is extremely drought tolerant, and stands up to the rigors of container planting. It also holds its color and shape deep into fall. Ornamental cabbages and kales are a great way to add unique fall color to any planter. The selection of red, purple, green, and near-white foliage is stunning when used in pots and containers. 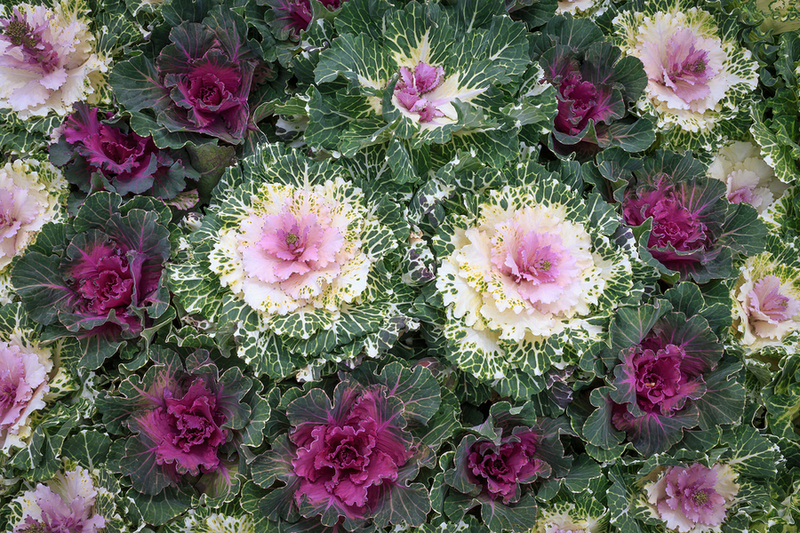 Ornamental cabbages and kales (pictured at the top of the article) are bred for their color and unique foliage – not their taste. In fact, although the leaves can be consumed, they are quite bitter to the taste. They are wonderful when planted in single pots, or grouped in large pots and containers around a focal point. Most varieties grow between 6 and 12″ in diameter, depending on the climate where they are grown. The warmer the climate, the larger the growth. Ornamental cabbages and kales are extremely hardy. They stand up to frost and freezing temperatures well, and stay crisp and fresh-looking deep into winter. The stunning color of peppers makes ornamental peppers perfect for container plants, especially in the fall. Ornamental peppers are wonderful for containers anytime of year. The compact nature and heavy bloom load of ornamental peppers make them ideal for baskets and planters. But in the fall, they really come to life! Most ornamental peppers are at their peak of blooming as the cooler temperatures of fall arrive. Varieties such as sangria, chili-chili and poinsettia are overloaded with multi colored blooms, bringing life and color to any planter. Plants will continue to produce up until the first hard frost. But long after they stop producing, the peppers look stunning as they dry on the plants. Sedum is a tough and hardy perennial, that also doubles as a perfect choice for fall containers. It blooms from late summer to late fall, and the thick foliage and compact bundles of blooms that form on top of the leaf canopy make it ideal for planters. And when it comes to selection, there is a lot to choose from! Autumn Joy is one of the most popular, with it’s lime green foliage and faded red blooms. It subtle beauty is nearly perfect for any fall planting. Two more varieties good that are great for planters are Black Jack and Purple Emperor. Black Jack’s stems soar 20″ or more and are loaded with dark purple leaves and pink flowers. Purple Emperor is has beautiful deep purple foliage, along with purple and pink blooms. Best of all, you can overwinter the plants in the garage or basement, and plant them into the landscape early next spring. It makes for a great “double-duty” plant! November 7, 2018 TIMG Comments Off on Bringing Ferns Indoors For Winter – How To Save Ferns For Next Year!